To the right is the bright Orion Nebula, the closest stellar factory to us, located some 1350 light-years away in the constellation Orion. Here new stars are born out of the dense clouds of gas and dust, and the youngest and brightest stars that we see now are only between 10,000 and a few hundred thousand years old. The nebula is illuminated primarily by the four bright young stars visible in the centre, which form a small cluster called the Trapezium. The radiation pressure from these young stars have sculpted a vast cavity with brightly coloured glowing walls that we see from Earth as the familiar shape of the Orion Nebula. The nebula is also known as Messier 42 or NGC 1976 and is one of the brightest nebulae in the sky, easily visible just south of Orion's Belt using even the smallest binoculars. It is approximately 24 light years across and forms part of the much larger Orion Molecular Cloud Complex - a huge clump of very cold gas that has a total mass of about 2000 times that of the Sun. The gas from this cloud slowly collapses due to gravity and stars are formed. Whenever a bright new star is formed, its strong light evaporates the opaque gaseous surroundings it formed from, thus allowing us to see it. The Orion Molecular Cloud Complex extends far beyond the bounds of this image and includes many other famous objects such as Barnard's Loop, the Horsehead Nebula, the Flame Nebula, Messier 78, and NGC1999. Left of the Orion Nebula, in this image, lies Sharpless 279 which is the northernmost part of the asterism known as Orion's Sword. It was discovered by William Herschel in 1786 and contains several NGC nebulae (NGC 1973, NGC 1975, and NGC 1977) as well as the open cluster NGC 1981. Within the nebulousity lies a bright reflection nebula popularly known as the Running Man Nebula. 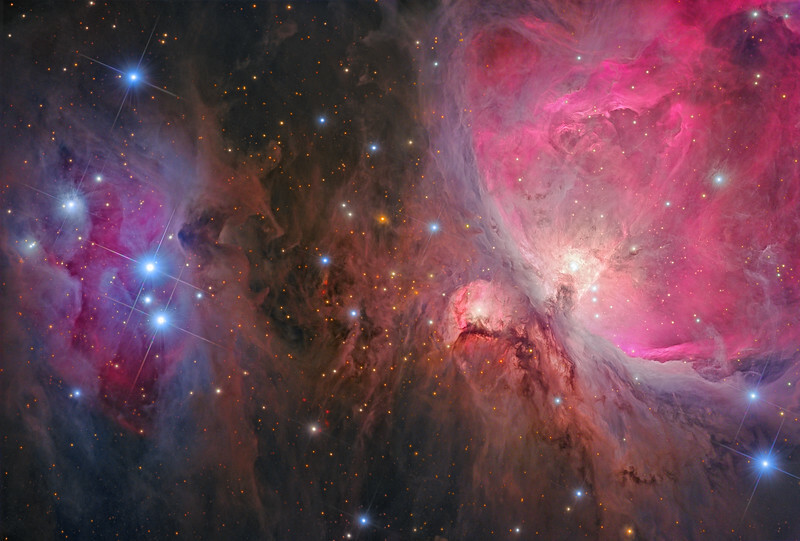 The very colourful appearance of the entire area is due to a complex play of light and shadow throughout the intricate clouds of gas and dust, resulting in both a prominent red/pink hue from the emission of ionised hydrogen and fainter earth tones from the obscuring dust as well as blue reflected light from numerous bright young stars. The youngest stars shine primarily in the infrared and many appear as golden red in this image, but only a minority of these youngest stars are visible in traditional optical light images. Infrared light penetrates the dust clouds better and allows for a peek deep into the heart of the nebula, revealing hundreds of bright young stars that are otherwise completely invisible. The Orion Nebula is one of the most studied objects in the sky and also has a significant place in the history of astrophotography. In 1880 it was the first ever nebula to be photographed; Henry Draper used the newly invented dry plate process to acquire a 51-minute exposure of the nebula with an 11 inch telescope. Subsequently, in 1883, amateur astronomer Andrew Ainslie Common recorded several exposures up to 60 minutes long with a much larger 36-inch telescope, and showed for the first time that photography could reveal stars and details fainter than those visible to the human eye.